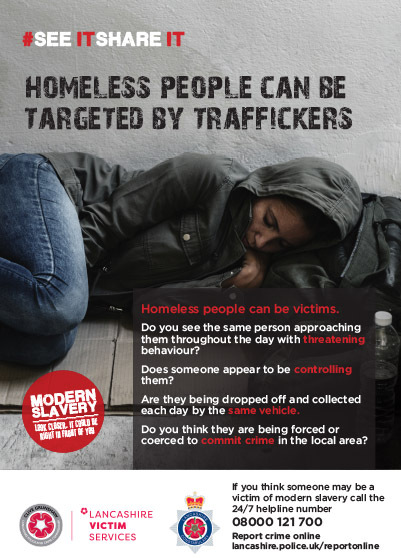 Lancashire Police, along with partners, including health, local authorities, charities and faith groups, will be out in towns and cities across Lancashire w/c 28 January, to raise awareness of modern slavery and how it can affect the homeless and rough sleeping community. Op Aident is a north west campaign aimed at highlighting how the homeless can be victims and be vulnerable to exploitation, helping them spot the signs and signposting them in the direction of where to get help and support. On Monday 28 January, teams will be at the Foxton Centre in Preston from 11am where Stewart Roberts who is an ambassador from Haircuts4homeless will be donating his time to give free haircuts. Haircuts4homeless is a community of skilled hairdresser volunteers who give their time free of charge to give haircuts for homeless people. Homeless people have many challenges to face, one of them often being low self-esteem and a haircut can have a great effect on someone, giving them a real boost. On Tuesday 29 January, Blackpool Victoria Hospital will be hosting a stall to raise awareness internally and externally and outreach volunteers will be out across Blackpool giving out winter hand warmers to the homeless. Wednesday 30 January, teams will be out and about in Blackburn town centre. Thursday 31 January, an outreach team of volunteers supported by Burnley FC’s Community Café will be raising awareness of modern slavery in Burnley. Friday 1 February, outreach teams along with health representatives will be engaging with the homeless in Preston and Lancaster. Sergeant Abi Finch-Hall of Lancashire Police said: “Modern slavery is happening in Lancashire and could be taking place in your local area. The more awareness we can generate the better, not only within the homeless community, but also with retailers and businesses who may interact with the homeless or rough sleeping community. “Signs to look out for include: Potential exploiters may look to recruit victims at places where the homeless or rough sleeping community spend time together. Exploiters may display threatening behaviour or appear to control their victims in some way. You may see people being dropped off or collected at the same time by the same vehicle. Potential victims could also be forced or coerced into criminality or forced to beg on behalf of their exploiter.